Who on earth would use all these to explain the rules of grammar? Must be Patricia T. O’Conner! Just like Woe Is I, her national bestseller for adults, the junior version uses simple language and entertaining examples to make good English fun. Hey, grammar doesn’t have to be gruesome or gross or grim. How gratifying! This is one reference book you’ll enjoy pulling off the shelf. To buy Woe Is I Jr., visit your local bookstore, Amazon.com, or Barnes&Noble.com. 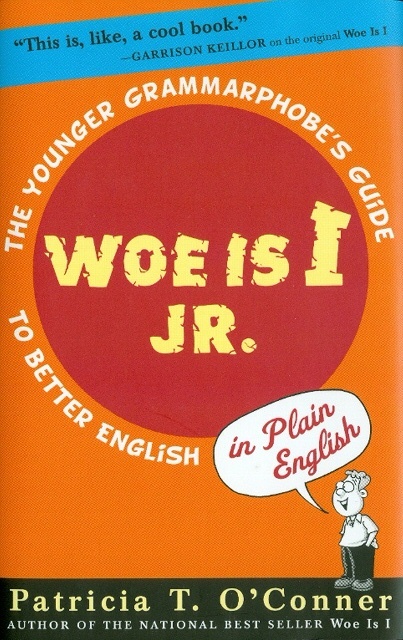 Praise for Woe Is I Jr.
A “smart, funny guide to grammar and style” for children. You can say “Woe is I” if you want to sound like the Queen of England. But if you want to sound normal and still be correct, this is the book for you.